Bohemian cabalist and liturgical poet; died at Prague April 10, 1439. He lived for a time at Ratisbon, but settled permanently at Prague after 1409. Ḳara enjoyed a high reputation and associated with King Wenceslaus, who liked to converse with him on religious matters. Ḳara nevertheless led a life of poverty, and collections were made in several Jewish communities to provide him with a livelihood. He was the author of the following works, still extant in manuscript: haggadic notes and gemaṭriot on the Pentateuch (Neubauer, "Cat. Bodl. Hebr. MSS." No. 2273); notes on Isaiah xlvi. 18 (ib. 186, 2); "She'elot u-Teshubot," responsa, allegorical in character (ib. 1598, 4); "Ḳodesh Ḥillulim," a cabalistic work (MS. Fuenn). 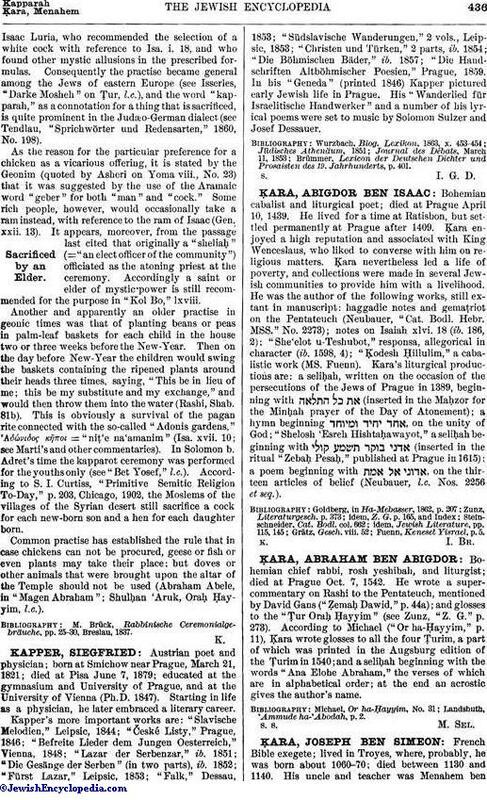 Kara's liturgical productions are: a seliḥah, written on the occasion of the persecutions of the Jews of Prague in 1389, beginning with (inserted in the Maḥzor for the Minḥah prayer of the Day of Atonement); a hymn beginning , on the unity of God; "Shelosh 'Esreh Hishtaḥawayot," a seliḥah beginning with (inserted in the ritual "Zebaḥ Pesaḥ," published at Prague in 1615); a poem beginning with , on the thirteen articles of belief (Neubauer, l.c. Nos. 2256 et seq.). Fuenn, Keneset Yisrael, p. 5.